One of Japan's leading tourist spots is Kyoto. We at MATCHA have written about this renowned city often in the past. Here are some articles you should check if you're headed to Kyoto. One of Japan's leading tourist spots is Kyoto. We at MATCHA have written about this renowned city often in the past. Today we will be introducing 6 Kyoto-related articles that you should absolutely read before visiting. Check out Kyoto from MATCHA's perspective. When you think of Kyoto, you might think of a culture-rich traditional Japanese town. Yes, that is a large part of Kyoto, but that's not all it has to offer. One example that immediately comes to mind is the Kyoto International Manga Museum. It is a library specializing in manga, where over 300,000 manga comics are stored. There is nowhere better to experience Japanese manga culture than here. There are original goods that can only be purchased here as well as some unique exhibitions and displays. Over 10% of the visitors here are said to be visitors from overseas. Find out for yourself why it's so popular in our article focusing on it. The first thing that Kyoto visitors notice and are surprised at is the beauty of Kyoto Station. The grid-patterned arcade is said to have been inspired by the old townscape of Kyoto. Sunlight gently pours in to help build the excitement of your upcoming journey. Just admiring the architecture is fun too, but from the rooftop, you can overlook the whole city of Kyoto, so we recommend you drop by at the beginning of your Kyoto trip. The famous tourist attractions of Kyoto are located close to the center of the city so many tourists leave Kyoto without visiting anywhere outside of the city itself. But if you go a little way out of town, you will find yet another side of Kyoto. For example, to the north is the ocean, where you can enjoy the atmosphere and beautiful natural scenery of Japanese fishing towns. Ine is one of those towns. From the unique funaya (traditional fishermen's houses), you can gaze out at the gentle waves of the sea. If you're going to Kyoto, you can't miss the temples. Just visiting a temple is nice, but there is so much more to enjoy. Why not try experiencing some zen meditation? In this article, we introduce how you can casually experience zen meditation at a temple called Ryōsokuin temple. There are countless delicious Japanese restaurants in Kyoto, but we recommend Jo-Social Sake Bar to visitors from abroad. Jo-Social Sake Bar is a restaurant that offers sake tasting to Japan-visitors. At many long-established restaurants in Kyoto, communication might be tough in languages other than Japanese, but not here. This place has been targeted at visitors from overseas from the beginning. Not only can you taste some great sake, you can also experience transforming into a samurai or maiko for some photos. 6. Let’s Explore Kyoto’s Most Popular Spot: Fushimi Inari Shrine! 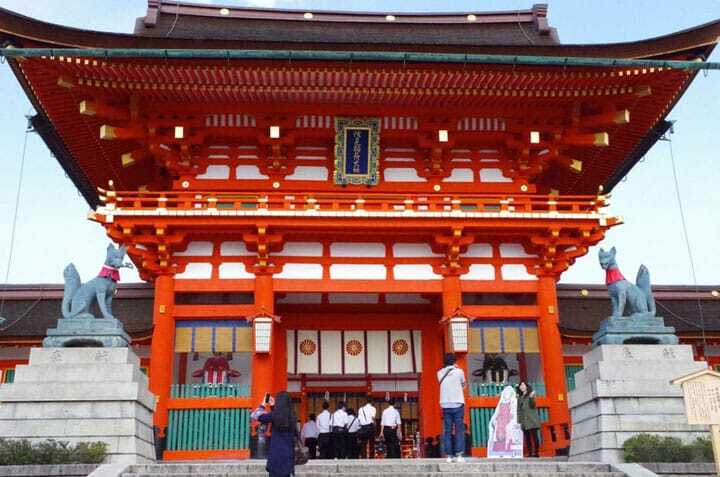 On travel review site TripAdvisor, Fushimi Inari Shrine was chosen as "Japan's Most Popular Tourist Destination" in 2014. It is known for is wondrous Senbon Torii ("The One Thousand Torii Gates"). You can explore Fushimi Inari Shrine through Google Street View in this article. If you were wondering whether to go on a Kyoto trip, this article will help you get a feel of what it's like. Let’s Explore Kyoto’s Most Popular Spot: Fushimi Inari Shrine! What do you think about our selection? We bet you're feeling the need to go to Kyoto right away. We will continue to share great tourist spots in Kyoto here at MATCHA. Try searching "Kyoto" on our website to find more fascinating Kyoto destinations.